Water rushed over levees on both sides of the Industrial Canal on Friday, threatening the 9th Ward, just drained from Katrina. But the breaches threatened few lives, as New Orleans, from Lakeview to Uptown and from the Bywater to Mid-City, remained a vacant and scarred place, most residents waiting in exile as the second storm in less than a month bore down on Louisiana. It was a respite interrupted by a new wave of fear. New Orleans, along with St. Bernard and Plaquemines parishes, took water in familiar places, clearly unprepared for a grazing by Category 3 storm aimed for the Texas-Louisiana border. About 150,000 people had been evacuated from southwest Louisiana, with about 35,000 at in-state shelters, authorities said. NEW ORLEANS (CNN) -- A storm surge from Hurricane Rita topped two patched New Orleans levees Friday, leaving the city's 9th Ward immersed in floodwater as deep as 4 feet, a general who toured the area said. "It's spreading rapidly down to the south-southeast, so they're going to have complete flooding in that area again," Maj. Gen. Bill Caldwell told CNN. Caldwell, commander of the Army's 82nd Airborne Division, said floodwater had spread across 30 to 40 city blocks by noon. Water in Lake Ponchartrain has risen two feet and flooding out of the Industrial Canal seen so far is of an “overtopping nature,” an official with the U.S. Army Corps of Engineers said this afternoon. The flooding is on the west side of the industrial canal. It certainly moving west through industrial and residential areas but Stephen Browning, director of programming for the Corps, said he didn’t think the water would go any further than Almonaster Avenue, which is a dozen blocks away from the canal in some places. NEW ORLEANS (AP) -- Hospitals across the city faced deteriorating conditions Tuesday after two levees broke, sending water coursing through the streets of the Big Easy. An estimated 80 percent of the below-sea-level city was under water, up to 20 feet deep in places, with miles and miles of homes swamped. As floodwaters rose around Charity Hospital, the rescuers needed their own rescuing. BY Jim Wilson Published on: September 11, 2001it describes what could happen to New Orleans if a Category 5 storm hit the city. Emergency planners believe that it is a foregone conclusion that the Big Easy someday will be hit by a scouring storm surge. And, given the tremendous amount of coastal-area development, this watery "big one" will produce a staggering amount of damage. Yet, this doesn't necessarily mean that there will be a massive loss of lives. So far, it looks like this prediction is accurate. 10:30 a.m. - This shot, taken from the third-floor roof of the Times-Picayune building during a slight break in the rain, shows where Hurricane Katrina's winds ripped away a large portion of the white covering of the Superdome on Monday morning. NEW ORLEANS, Louisiana (CNN) -- Hurricane Katrina flogged Louisiana's southeastern shore Monday morning with sustained winds in excess of 135 mph as it moved inland, the National Hurricane Center said. 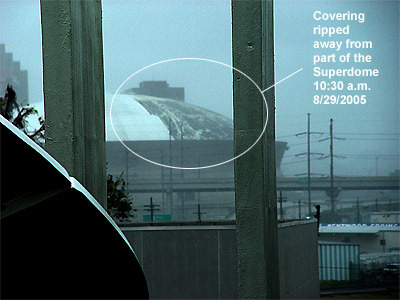 New Orleans, braced for a catastrophic direct hit from the powerful Category 4 storm, hunkered nearly 10,000 people in its mammoth Superdome, but Ed Reams of CNN affiliate WDSU reported that the structure has begun leaking as the winds damaged the roof letting daylight and rainwater in the darkened arena. "I can see daylight straight up from inside the Superdome," Reams reported. National Guard troops moved people to the other side of the dome. Others were moving beneath the concrete-reinforced terrace level. "This is only going to get bigger," he said. "We have another two hours before the worst of the storm gets to us." City officials estimated that 1 million people had evacuated the area as the storm approached. Forecasters predicted the storm surge could reach 28 feet; the highest levees around New Orleans are 18 feet high. At 9 a.m. ET, the storm was centered about 40 miles southeast of New Orleans, Louisiana, and 65 miles southwest of Biloxi, Mississippi. Hurricane force winds extended about 125 miles from the storm's center. The storm was moving toward the north at 15 mph. Hurricane Katrina made landfall Monday between Grand Isle, Louisiana, and the mouth of the Mississippi River -- and the worst is yet to come, National Hurricane Center forecaster Richard Knabb told CNN. 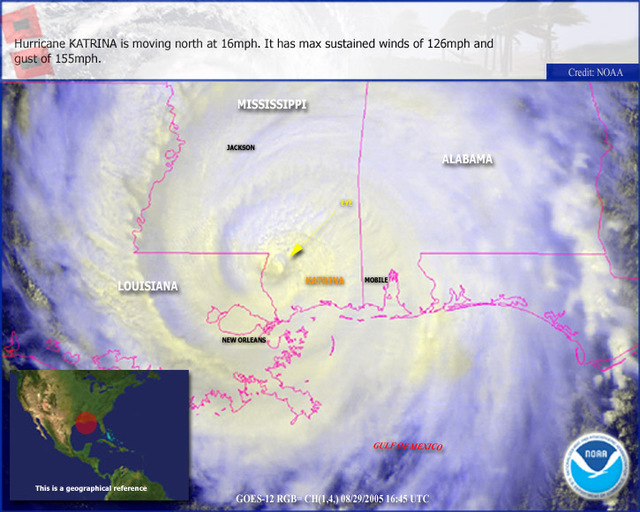 Katrina jogged to the north in the night, early enough to push the massive storm just off what had been a direct line to New Orleans, moving its eastern eye wall instead toward Biloxi and Gulfport, Mississippi, where CNN's Gary Tuchman found a boat washed onto a normally busy street. "This is not the strongest part of the hurricane yet," Tuchman reported, battling the wind outside his truck. "This is the street where this boat is now. It's completely flooded. It's only going to get worse." The counterclockwise spin of a hurricane makes the worst damage on its eastern edge, but CNN meteorologist Chad Myers cautioned that "there's not really an easy side of a Category 4 storm" on the Saffir-Simpson scale. The Hurricane Center said that a 113 mph wind gust was reported in Pascagoula, Mississippi. In Biloxi, CNN meteorologist Rob Marciano reported that wind gusts topping 100 mph were starting to pull the roofs off of nearby buildings. Hurricane warnings are posted from Morgan City, Louisiana, eastward to the Alabama-Florida state line, including New Orleans and Lake Pontchartrain. This means winds of at least 74 mph are expected in the warning area within the next 24 hours. A tropical storm warning and a hurricane watch are in effect from the Alabama-Florida state line eastward to Destin, Florida, and from west of Morgan City to Intracoastal City, Louisiana. A tropical storm warning is also in effect from Intracoastal City, Louisiana, west to Cameron, Louisiana, and from Destin, Florida, eastward to Indian Pass, Florida. A tropical storm warning means tropical storm conditions, including winds of at least 39 mph, are expected within 24 hours. A hurricane watch means hurricane conditions are possible, usually within 36 hours. Isolated tornadoes are also possible Monday across southern portions of Louisiana, Mississippi, Alabama and the Florida Panhandle, forecasters said. Three residents of a New Orleans nursing home died Sunday while being evacuated to Baton Rouge, said Don Moreau, chief of operations for the East Baton Rouge Parish Coroner's Office. The 23 residents were supposed to stay at a church, where one of the bodies was found. The other body was found on a school bus and a third person died at a hospital, Moreau said. The others were found to be suffering from various forms of dehydration and exhaustion, he said. Moreau did not know whether authorities would term the deaths storm-related. "These people are very fragile," he said. "When they're loaded up on a school bus and transported out of New Orleans ..."
One person died in similar circumstances during evacuations from Hurricane Ivan, he said. gory 5 is the most intense on the Saffir-Simpson scale. Only three Category 5 hurricanes have made landfall in the United States since records were kept. Those were the Labor Day hurricane of 1935, 1969's Hurricane Camille and Hurricane Andrew, which devastated the Miami area in 1992. Andrew remains the costliest U.S. hurricane on record, with $26.5 billion in losses. Katrina edged slightly to the east shortly before making landfall near Grand Isle, providing some hope that the worst of the storm's wrath might not be directed at the vulnerable city. Martin Nelson, a meteorologist at the National Hurricane Center, said the northern part of the eyewall came ashore at about 5 a.m. central time. Katrina's fury was quickly felt at the Louisiana Superdome, normally home of professional football's Saints, which became the shelter of last resort Sunday for about 9,000 of the area's poor, homeless and frail. Electrical power at the Superdome failed at 5:02 a.m., triggering groans from the crowd. Emergency generators kicked in, but the backup power runs only reduced lighting and is not strong enough to run the air conditioning. Mayor Ray Nagin said he believed 80 percent of the city's 480,000 residents had heeded an unprecedented mandatory evacuation as Katrina threatened to become the most powerful storm ever to slam the city. "It's capable of causing catastrophic damage," said National Hurricane Center Director Max Mayfield. "Even well-built structures will have tremendous damage. Of course, what we're really worried about is the loss of lives. New Orleans may never be the same." Crude oil futures spiked to more than $70 a barrel in Singapore for the first time Monday as Katrina targeted an area crucial to the country's energy infrastructure. The storm already forced the shutdown of an estimated 1 million barrels of refining capacity. Terry Ebbert, New Orleans director of homeland security, said more than 4,000 National Guardsmen were mobilizing in Memphis and will help police New Orleans streets. The Louisiana Superdome, normally home of professional football's Saints, became the shelter of last resort Sunday for thousands of the area's poor, homeless and frail. Some arrived on crutches, canes and stretchers, while National Guardsmen searched everyone for guns, knives and drugs. "We just took the necessities," said Michael Skipper, who pulled a wagon loaded with bags of clothes and a radio. "The good stuff -- the television and the furniture -- you just have to hope something's there when you get back. If it's not, you just start over." The head of Jefferson Parish, which includes major suburbs and juts all the way to the storm-vulnerable coast, said some residents who stayed would be fortunate to survive. "I'm expecting that some people who are die-hards will die hard," said parish council President Aaron Broussard. The evacuation itself claimed lives. Three New Orleans nursing home residents died Sunday after being taken by bus to a Baton Rouge church. Don Moreau, of the East Baton Rouge Parish Coroner's Office, said the cause was likely dehydration. Katrina, which cut across Florida last week, had intensified into a colossal Category 5 over the warm water of the Gulf of Mexico, reaching top winds of 175 mph before weakening slightly as it neared the coast. The storm held a potential surge of 18 to 28 feet that would easily top New Orleans' hurricane protection levees, as well as bigger waves and as much as 15 inches of rain. Tornado warnings were posted for Louisiana, Mississippi, Alabama and Florida. For years, forecasters have warned of the nightmare scenario a big storm could bring to New Orleans, a bowl of a city that's up to 10 feet below sea level in spots and dependent on a network of levees, canals and pumps to keep dry from the Mississippi River on one side, Lake Pontchartrain on the other. The fear is that flooding could overrun the levees and turn New Orleans into a toxic lake filled with chemicals and petroleum from refineries, as well as waste from ruined septic systems. Nagin said he expected the pumping system to fail during the height of the storm. The mayor said the U.S. Army Corps of Engineers was standing by to get the system running, but water levels must fall first. "We are facing a storm that most of us have long feared," he said. "This is a once-in-a-lifetime event." Major highways in New Orleans cleared out late Sunday after more than 24 hours of jammed traffic as people headed inland. At the peak of the evacuation, 18,000 people an hour were streaming out of southeastern Louisiana, state police said. On inland highways in Louisiana and Mississippi, heavy traffic remained the rule into the night as the last evacuees tried to reach safety. In Orange, Texas, Janie Johnson of the American Red Cross described it as a "river of headlights." In Washington, D.C., the Nuclear Regulatory Commission said it has been advised that the Waterford nuclear plant about 20 miles west of New Orleans has been shut down as a precautionary measure. New Orleans has not taken a direct hit from a hurricane since Betsy in 1965, when an 8- to 10-foot storm surge submerged parts of the city in seven feet of water. Betsy, a Category 3 storm, was blamed for 74 deaths in Louisiana, Mississippi and Florida. Evacuation orders also were posted all along the Mississippi coast, and the area's casinos, built on barges, were closed early Saturday. Bands of wind-whipped rain increased Sunday night and roads in some low areas were beginning to flood. "Hopefully it will take a turn and we'll be spared the brunt of it, but it just don't look like that," said James Bosco, who was packing up a final few items from his beachfront apartment in Gulfport. "I just hope everybody makes it all right. We can always rebuild." Alabama officials issued mandatory evacuation orders for low-lying coastal areas. Mobile Mayor Michael C. Dow said flooding could be worse than the 9-foot surge that soaked downtown during Hurricane Georges in 1998. Residents of several barrier islands in the western Florida Panhandle were also urged to evacuate.